Google is hoping to answer one of the longest-running consumer questions in travel booking (Am I really getting the best deal?) by making clear to consumers the average price of their ticket based on historical pricing information for that year. The new Google Flights feature lets users see their prices stacked up against others and on a gradient: low, typical, and high. The feature is available on mobile for flights in the U.S. beginning Monday, August 27. The pricing transparency push is apparently looking to go bigger than just airline travel prices. Google is also adding price comparison tools for hotels, so that consumers can get an idea of how good their deal really is. That means a customer looking to book in a popular city during a high-volume travel time — New York City during the holiday season, for example — will be able to see the historical pricing at the hotel they are contemplating. They will also be able to get a side-by-side comparison for other hotels in the same city within a similar price range and quality rating during the same time period. 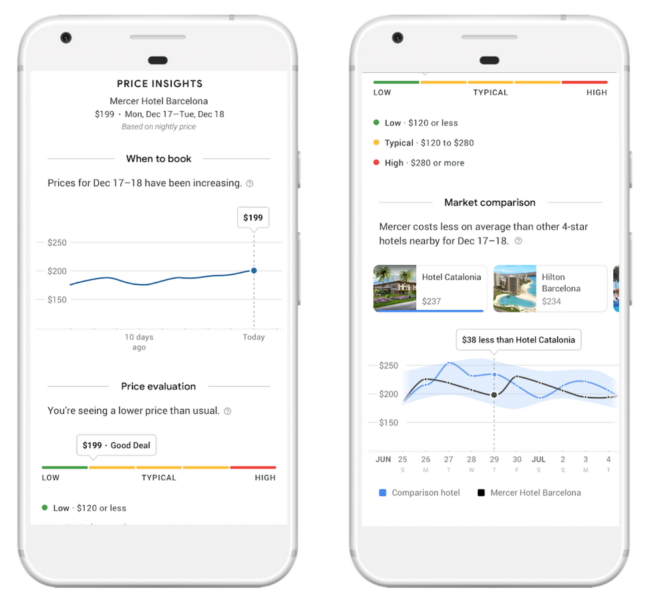 Price insights for hotels is available globally on mobile. Google is also looking to make it easier for flexible consumers to pick their vacation destination based on where the best deals are. Users can search large expanses of the world like “Southern Europe,” set a given time period, and Google Flights will return results with good deals highlighted in green. And — to keep it nice and sticky for consumers — Google is also rolling out a new collection of tools for travelers looking to get on the road during the 2018 holiday season. Always a big time of year for travel, consumers will be able track flight price trends, hotel deals and tourist activities for Thanksgiving, December’s cornucopia of celebrations and New Year’s Eve. 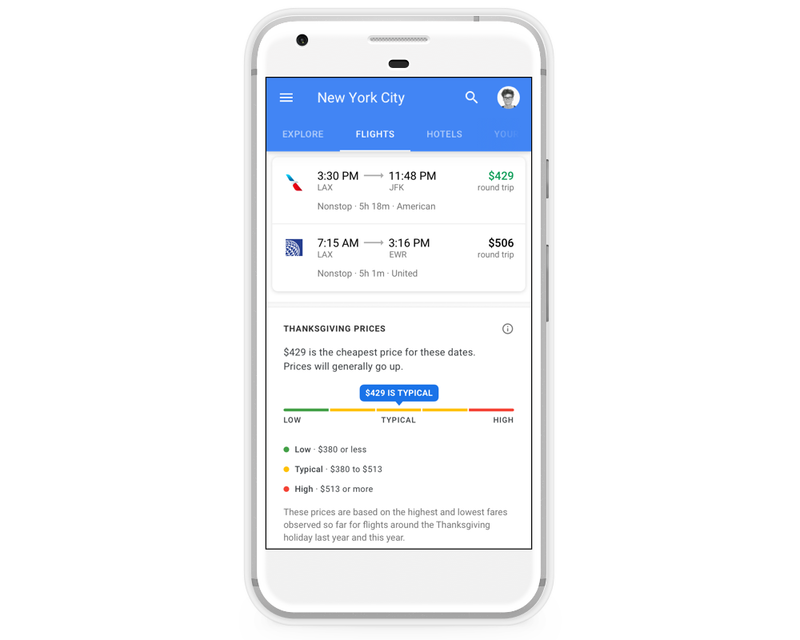 The updates are just a piece of the recent additions Google has been making to Google Flights as it fights for a bigger place in the travel booking vertical. Another set of add-ons follows flight delay estimation using machine learning and a full mobile reset from last year that it made it easier for both smartphone and desktop users to leverage the service to get better travel deals.